Disclaimer: I'm a total Rumiko Takahashi fanboy. Card-carrying member since '92. There has been no attempt for me to hide my love for all things Rumic in this world (including the adjective itself). So far, my Twitter avatars have both been Takahashi-based characters (Godai from Maison Ikkoku, Daisuke from Ranma 1/2). I actually loved the Mermaid Saga stories, and One-Pound Gospel is perhaps one of the most understated of her works. InuYasha threw me for a loop, but I found myself appreciating its animated run in Japan and consistently watched it while I was there. It was unfortunate to hear of InuYasha's ending, since that moment signaled the first time where I questioned if it truly was the last we'd hear of Takahashi. Her works were so extensive, almost spanning decades at a time, and she is easily one of the wealthiest mangaka in Japan. What other mountains were left to climb? However, we also forget the fact that Takahashi should still have lots of fuel left in her tank. She is still only 52; she started Urusei Yatsura when she was 21 in 1978. 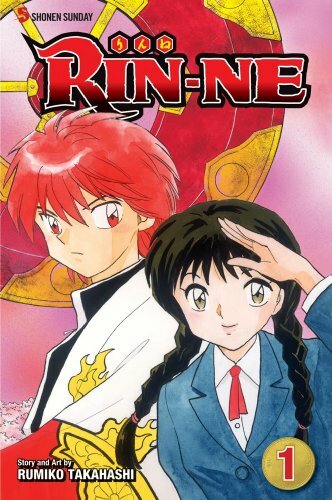 When Takahashi brought out her latest creation, Kyôkai no Rinne ("Rinne of the Boundary", titled RIN-NE in the U.S. release), the fans likely had to take a step back to breathe. Much like she did with Urusei Yatsura (oni), the Mermaid Saga series (ningyô), and InuYasha (yasha), Takahashi is turning to the mystical traditions of Japan, although she has opted to focus on the shinigami figure that has been the mainstay in stories such as Soul Eater, Death Note, Yû Yû Hakusho, and (most prominently) Bleach. While there is some crossover with the "obakemono" traditions of Japan, this story focuses more on the relatively comical passing of spirits to the underworld, led by the fiery-haired Rokudô, a high-school student born from the intersection of human and shinigami bloodlines. His accidental meeting with Sakura—a girl who has the power to see spiritual beings thanks to her own temporary "spiriting away"—during one of his exorcisms is not as accidental as it may appear. While the other students can't see him when he has on a haori coat from the Underworld, Sakura can, and she gets wrapped up in each of his attempts to send the school's spirits to the other side. Additionally, being a human shinigami has its limits both spiritually and financially, and the purchase of such goods to free these ghosts and rescue Sakura are not cheap to a dirt-poor student such as Rokudô. Throw in a cat-demon who is similar to Shippo from InuYasha (but less annoying than he ever was) and Rokudô's cougar age-defying shinigami grandmother, and the episodic comedy actually has a place to go. All in all, that's the relief that comes to mind after reading RIN-NE. With the drama of InuYasha gone, it's nice to have Takahashi returning to her roots. While she can tug on a heart-string every now and then, Takahashi's expertise is in comedy, and it's good that she's returning to what's made her so successful. The artwork remains simple, and the angle of each character's profile rarely changes from the fixed side-view, but that allows Takahashi to remain focused on her stories and characters. There may be arguments that Takahashi and Shônen Sunday are attempting to copy the success Tite Kubo and Shônen Jump achieved with Bleach, but I'm not so sure that Takahashi even wishes to fully copy herself. While Kubo has opted for focus on a plethora of angst-ridden characters and endless fighting sequences, Takahashi has actually pulled away from tension by focusing on cooperative efforts between Sakura and Rokudô. While there is little doubt Takahashi will not stray from her past devices (foes becoming friendly rivals in the end), Sakura and Rokudô are not your typical Rumic couple—no arguments, no relationship pressures, and no difficult emotions cloud their association in the beginning, and that could be a refreshing change of pace that makes this lighthearted comedy about the Afterworld even lighter. It's hard to say how the new shift to digital media and the weakening of the manga industry will affect Takahashi's works, Viz is already banking on a mix of the two, providing online translations of chapters the week they are released in Japan and eventual transitions of the volumes to paper print. While opinions on the Shônen Sunday page appear mixed, I feel confident that RIN-NE will do better than expected due to the Takahashi name alone and its appeal to fans of works in the past. RIN-NE. Vol. 1 on sale through Viz Media. 200 pages, $9.99. I liked Rin-ne a lot. It is indeed a welcome change of pace from a lot of the serious shinigami stories available. But at the same time, there are so many parallels to Bleach that it feels...I don't know, a bit forced. Or Maybe more accurately, like she's jumping on a bandwagon. I have high expectations of Takahashi's works, and from what I've read so far, it's still below something as amazing as Ranma or Inu Yasha. That said, I'm still giving it all the love I can. Because it's an entertaining series. I'm uncertain if this is a "bandwagon" story from Takahashi. She has always been a storyteller that has used the mystical and monstrous, whether it be modernized (the Oni in Urusei Yatsura), traditional (InuYasha), or foreign (Ranma 1/2). If anything, the story feels more Ranma 1/2 than Bleach. Bleach is much more fight-oriented, while Rin-ne is strictly comedy.